Twenty one years ago, we began with a little dream of living on the family farm while we farmed traditional row crops and invited some school children to the farm to pick a pumpkin. The farm was pretty much a wooly mess from years of minimal farming and lots of neglect. The old farm house belonging to Guy Corley was in complete disrepair and there were old cars, tractors and equipment everywhere. But we were young and our work ethic was strong. We made the choice that this was where we would raise our family and let the Lord guide what came next. It took us about two years to clean up the farm, plant some corn, build a house and move our family to the farm in August of 1999. Milt’s father and grandfather had left a mess, but when we peeled back the layers of old cars and overgrown portions of the farm, we found the old barns standing strong and ready for use. We chose the old tobacco barn as the entry point to the farm and started the cleanup process there. As we cleaned out buildings and barns we found more and more old equipment and kept it for future use. We planned our first season–2000 would be the year we would plant pumpkins and invite school children. We marked off the land and in June planted the first crop of pumpkins at Christian Way Farm. We didn’t have any animals yet so we built temporary pens for two calves, two sheep and two goats, all borrowed from farmers in the area. With the help of a friend, we created a simple little flyer and delivered to all the Christian County elementary schools. Honestly I (Janie) knew nothing about pumpkins. Pumpkin pie was always made from canned pumpkins and only one time had I ever even visited a pumpkin patch with my children. And to top it all off, I wasn’t hugely fond of farm animals. I grew up afraid of gathering eggs because the hens in my grandmother’s coops had always chased after me. Cows were the animals I had to chase and help corral when they got out on my childhood family farm. And Milt loved farming. But he didn’t really want to talk to groups of people. He would do the work and drive the hayride. He would clean up and care for the animals, but he didn’t want to teach the school groups when they visited. Then there was the issue of Halloween. It’s not our favorite holiday. In fact, we like none of the scary aspects of Halloween. We don’t watch scary movies and dislike haunted houses and haunted corn mazes. So how could we make a living selling pumpkins and a fall experience in a culture that loves Halloween? But God… (I love that phrase) had a plan and we just needed to follow it. Slowly the pieces came together. Back in the days when our internet was on dial-up, I spent some time searching for information about pumpkins and stumbled on an old website called “Pumpkin Evangelism”. 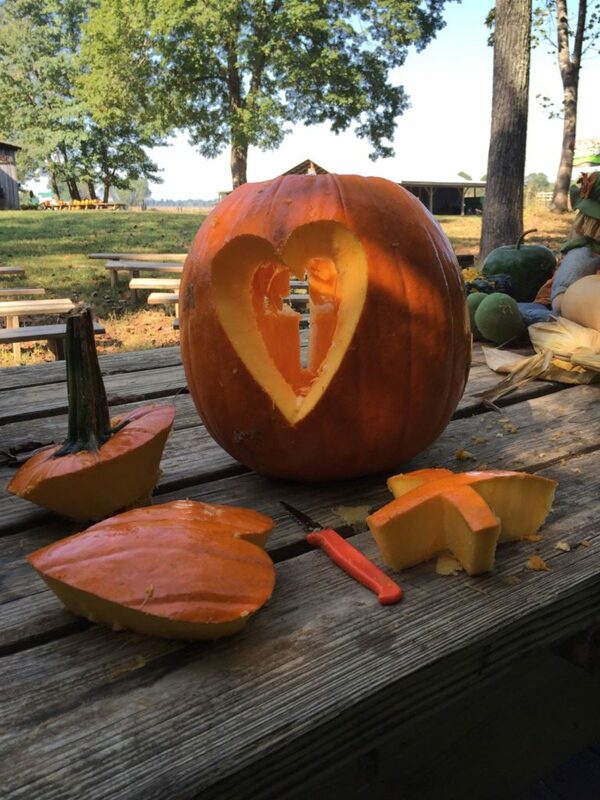 There is where I read about using the pumpkin to share the Gospel. And then I found a book called The Pumpkin Patch Parable, by Liz Curtis Higgs. This precious book just increased my confidence that we did have a story to tell and that God had a plan for us to open the doors to our pumpkin patch. I learned about pumpkins and Milt worked hard to clean up the farm. In late September, we acquired our borrowed pets, gassed up the tractor, set up my “storytime” behind the old tobacco barn and we were ready…..
Mrs. Norma Folz and her class of third graders from Sts Peter & Paul were greeted by a very anxious family. Our children stayed home from school that day to welcome our guests and attempt our first school tour. The expectant faces of those precious children thrilled our hearts. We were encouraged and eager to make this a fun day. And so here we are in our 19th season. The animals are no longer borrowed. The hayride has benches (to avoid the issues of allergies and bug bites). The hayride truck has straw bales for those that must have that experience. The story time has moved to it’s own special place. The barn is now a store and there is so much more to do. All those years ago, we would never have dreamed or could even imagine that so many people would accept our invitation to come visit the farm. But here we are 120,000 people later and excited for more. And the story? It hasn’t changed. It’s only gotten better. No longer do I use a book. Just some awesome photos and a pumpkin. That story–it’s timeless. About a God that loves us and goes to great lengths to clean out our messy hearts and teach us to love others…. Want to hear that story? Schedule a group tour with us, or come see us on October 20th (Harvest Praise). We will tell that story all day long. Inquire about a date to come when another group is scheduled. Or just ask me (Janie)–if there is anyway possible, I will stop to tell you the story.